Air7Seas is an experienced shipping company specialized in international both Air & sea freight. We have well experienced team with standard job skills to handle our customer's shipment. Our goal is to provide best shipping service to our clients with reduced cost. Our services are like shipping household goods, commercial goods, vehicle shipping to china, we also do both air & sea freight services. We do our shipping services for large & small companies and individuals as well. We also have some reliable agent network around the globe to take care of all kinds of our shipments like air freight and ocean freight. International shipping could be like complicated process, but we Air7Seas have simple solutions for our customers with the years of experience in shipping industry. 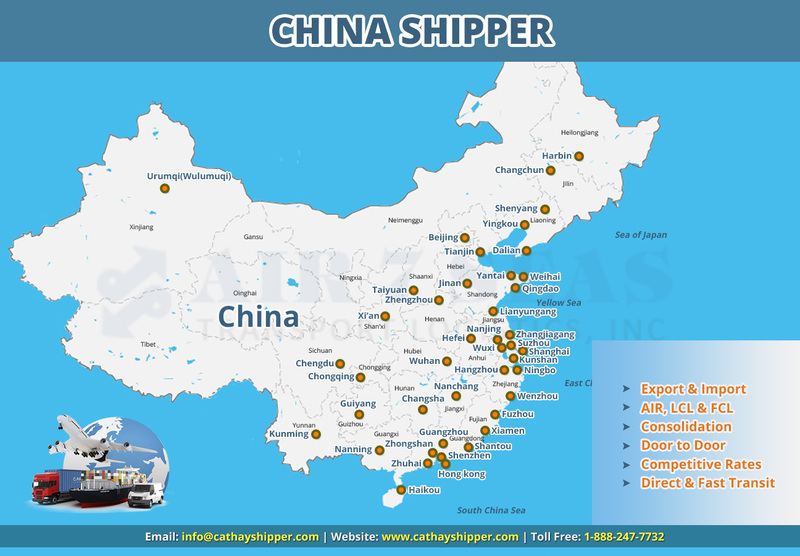 We provide high level dedicated service to fulfilling all customers' requirements while shipping to china. There are some customs formalities to be done on arrival of china ports. We have skilled and experienced officials in customs; they can help our customers throughout the customs process. While planning to transport household goods to china we need to consider some of the customs regulations on household goods. Wood packing materials should get USDA certification of heat treatment or the exporter should be certified that the packing materials in the shipment are not conifer wood. This regulation is apply for both air and sea transportation. Improperly certified household goods are subjected to one of the following actions. Shipment will be separated at the exporter's expense and the packing materials will be destroyed. If the shipment is not able to return to origin and not able to separate the shipment & packing materials then both the shipment and packing materials will be destroyed. Original passport and Authorization letter. List of household goods and quantity. Application of import of personal effects (Import permit). Customs Permit (Must be approved prior to arrival of household goods). Customs Permit and household goods and Personal effects inventory must Match Exactly. While shipping to china we need to aware of the import laws in china. It is very much import to know the prohibited & restricted items of the country before doing the packages. Cameras, watches, clocks and their parts and accessories. Computer/Printers - only one of each item allowed per customer. Films, tapes, any printed materials which is detrimental to the political, economic, cultural and moral interests of the People's Republic of China.